What do you do when a native bird just won’t learn to help himself? For one yellow-eyed penguin, it was time for the tough love approach. 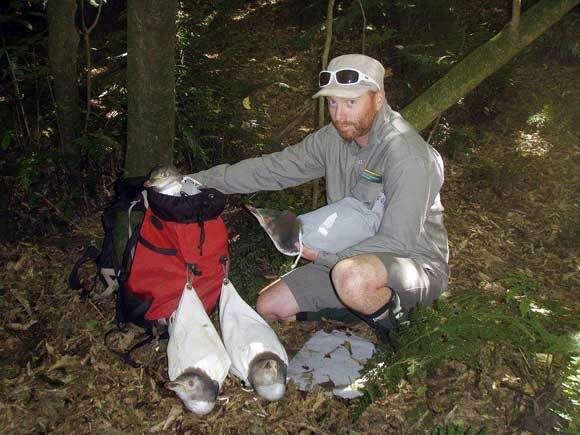 This year we witnessed a disastrous breeding season for yellow-eyed penguins on the mainland. Every year in November and December, chicks begin to hatch around the wild beaches of the Catlins, Otago Peninsula and North Otago. There are often a few chicks that are abandoned by their parents or aren’t well fed, and need to be removed from their nests for supplementary feeding. But this year, a late breeding season and lack of fish to eat has meant a large number of chicks have gone hungry, and many have died. 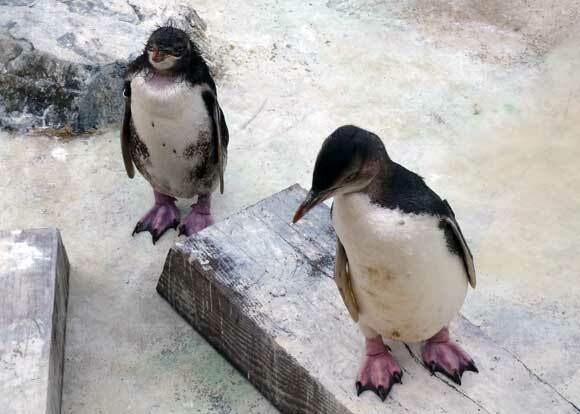 To help protect the population of what is thought to be one of the world’s rarest penguin species, we remove underweight chicks from the nest before fledging and take them to rehabilitation centres like Penguin Place on the Otago Peninsula. 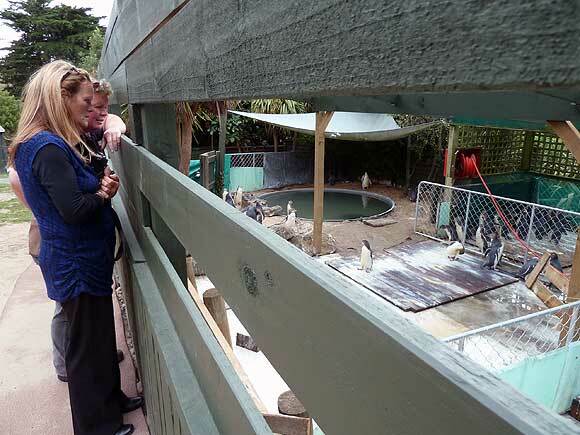 So earlier in the year, 63 chicks were removed from the Catlins and taken to Penguin Place. This included chick J19013 (a lively young male, according to his measurements), who was taken on 10 February from Penguin Bay, weighing only 3.8 kg. J19013 was first released from Penguin Place on 20 March at a fine 5.2 kg, but returned to the release location in early April, again underweight. So he was taken back to rehab, fattened up, and released again 14 April. However, the same thing happened again; he returned to the release site a few days later underweight, and was fattened in rehab again. All in all J19013 was released six times! After talking with J19013’s caretakers, we decided to take a ‘tough-love’ approach—by bringing this bird back to the Catlins, a 1.5 hour journey by road, for a hard release at Jacks Bay, close to where he hatched. The area was monitored over several days to ensure that this charismatic young bird took to the sea. J19013 took off like a rocket when we let him out of the cage, and disappeared quickly into the surf. 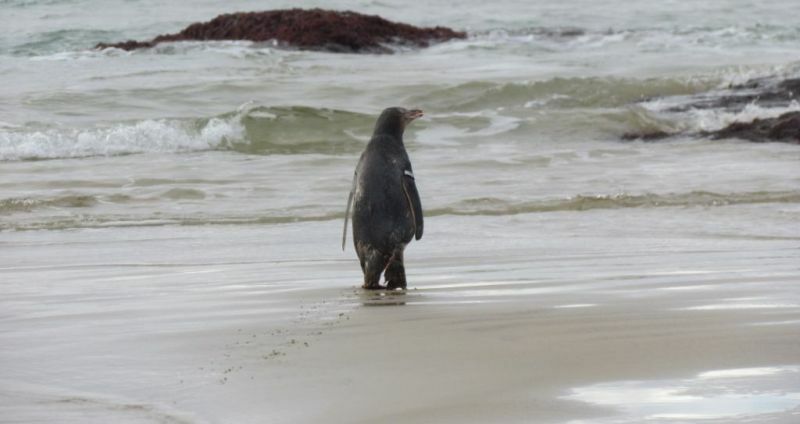 Now he’s either got a heck of a long swim back to Penguin Place, or he will have to learn how to catch his own dinner. Sometimes our native species have it tough out there in the wild. 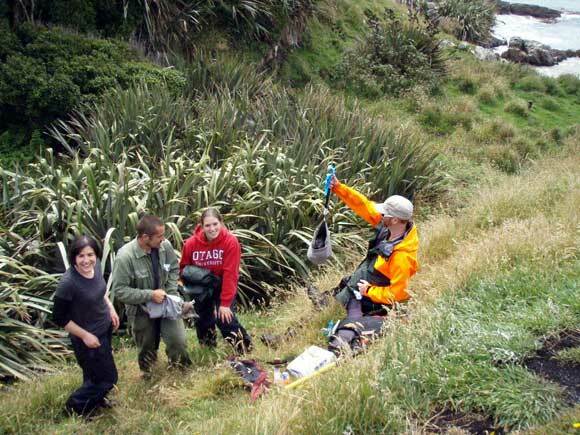 This year large numbers of yellow-eyed penguin/hoiho chicks – natives of coastal Otago – have had a particularly challenging first few months of life. 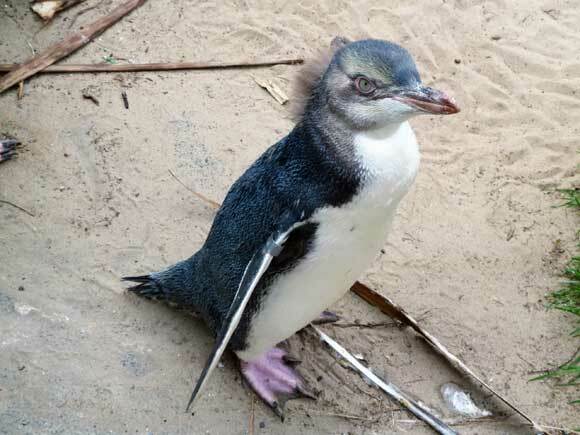 Every year in November/December yellow-eyed penguin chicks begin to hatch around the wild beaches of the Catlins, Otago Peninsula and North Otago. There are often a few that are abandoned by their parents or aren’t well fed, and need to be removed from their nests. But this year a late breeding season and lack of fish to eat has meant a large number of chicks have gone hungry and many have died. Fortunately, around 80 of these chicks and juveniles are now in the care of Penguin Place. Penguin Place is a privately run conservation effort and tourism operation, funded through the guided tours they conduct. This project began in the mid 80’s as a family-run conservation project and nature tourism experience. 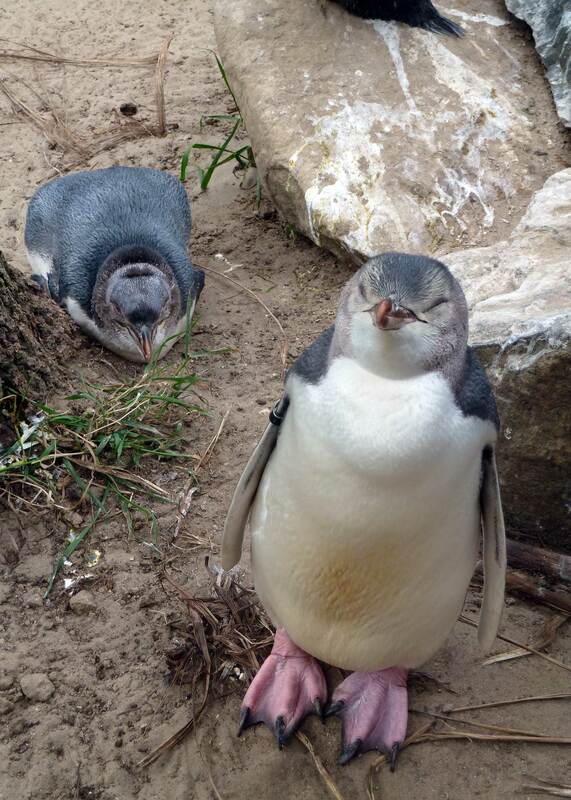 They now carry out a range of conservation work including a research programme, trapping predators, providing safe nest boxes, restoring a stretch of coastline to prime penguin habitat, and rehabilitating sick and injured penguins in its penguin hospital. Throughout the breeding season, a small team of DOC rangers and volunteers monitor the penguin nesting grounds, conducting health checks of the chicks to make sure they are well fed and gaining weight. Those that are showing signs of starvation or other ailments are removed from the nest where needed and taken to safe havens like Penguin Place till they fatten up and are ready for release. Feeding 80 hungry beaks is a big job. It takes two keepers three hours twice a day to hand feed all of the penguin hospital’s current patients – and they’re consuming up to 80 kilos of fish per day! Plus, because they’re still growing, these young patients need fish that’s full of protein and other vitamins, preferably small whole fish with blood, guts and bones. Thankfully some generous partners have come to the aid of Penguin Place this year. 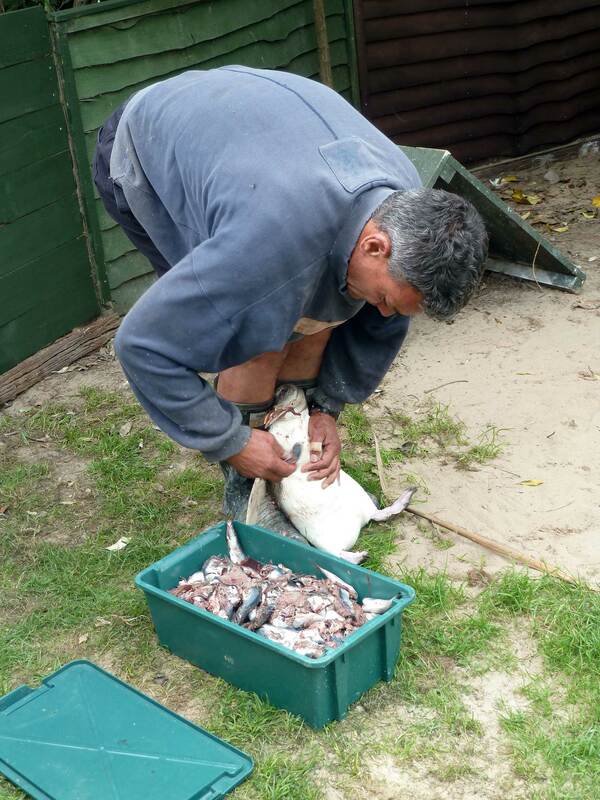 Talleys Nelson contributed an emergency supply of one tonne of pilchard; and seafood company Sanford Limited has just agreed to provide an ongoing donation of up to six tonnes per year. DOC doesn’t run its own facilitates for providing the specialist care that’s needed to rehabilitate sick or injured wildlife. We work in partnership with a number of specialist organisations like Penguin Place, who have permits from DOC to care for native species. These organisations play a really important role in conservation. So next time you’re in Dunedin pop by, join a tour or make a donation, and show your support.